Nothing says ‘winter’ to me like pizzoccheri alla valtellinese, an Alpine buckwheat pasta dish oozing with melted cheese and winter vegetables, a typical dish of the Valtellina in the uppermost stretches of Lombardia, a fairly narrow valley region running northeast from the Lago di Como along the border with Switzerland. You make the pizzoccheri as you would any fresh pasta, but using 2 parts of buckwheat flour to one part regular wheat flour. (Buckwheat flour lacks gluten and needs some help to form a workable dough. Some recipes call for less regular flour, but the 2:1 ratio works well for me.) I use egg (and a bit of water) to bind the dough, but the original recipe (see below) calls for water only. Roll out the pasta rather thicker than other kinds of fresh pasta (I use setting “3” on my KitchenAid pasta roller) and let the rolled pasta sheets dry on a towel. Once dry enough, cut the sheets into strips, as wide as fettuccine or tagliatelle, say about 1 to 1.5cm (1/2 inch) wide and about 5-7 cm (2-3 in) long. Allow these little strips to dry out further while you prepare the rest of the dish (see photo above). While your pizzoccheri are drying, prepare the vegetables that will accompany them, typically potato and a leafy winter vegetable, most often Savoy cabbage. Slice or cube the potato, as you prefer (I like them sliced) and immerse them in cold water. Shred your cabbage and add it, too, to the water. Instead of Savoy cabbage, you can also use spinach, swiss chard leaves or—as I did this time when I couldn’t find Savoy cabbage at the market—coste, or the stalks of swiss chard, trimmed of their leaves and cut into lengths about the same size as the pizzoccheri. Precise proportions are not critical in this kind of dish, but I like to use about one smallish potato and say 100g (4oz.) of leafy vegetable per serving. 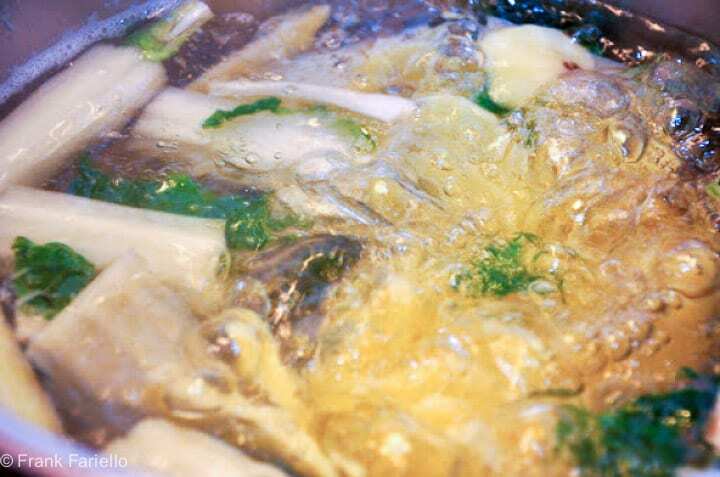 Bring a large pot of water to the boil, salt generously, and add your vegetables. While the vegetables are cooking, melt a nice big piece of butter—at least 50g/2oz. per serving to which you add a clove or two of garlic and a sprig of fresh sage. 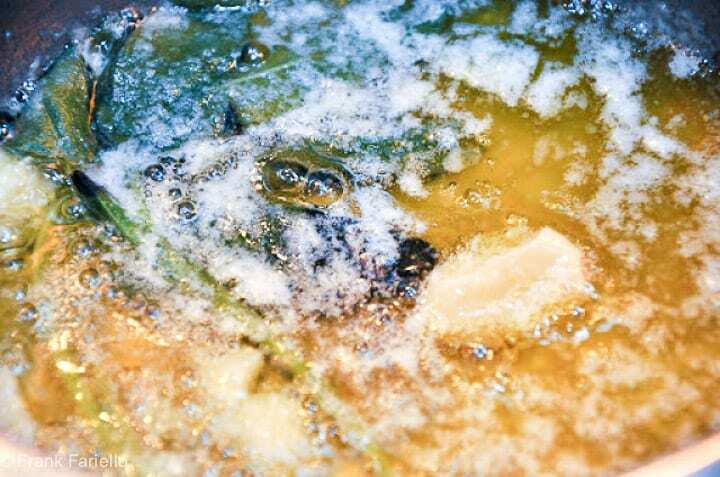 Allow the garlic and sage to simmer very gently in the melted butter until the butter is infused with their flavors. Do not allow the butter to brown; the garlic should brown, if at all, only slightly. Remove the garlic and sage when you’re done. While the butter is simmering, either slice or shred some mild, semi-soft cheese, the most classic choices being the local cheeses bitto or Valtellina Casera. But since these cheeses are hard to find, even in Italy, outside their zone of production, fontina is often substituted. And if you can’t find fontina, I’d recommend staying in the Alps and using either Gruyère or Emmenthal. Grate about half that amount of parmesan cheese or grana padano. I like to use a lot of cheese as well, say 50g/2 oz. per serving, although you can use much less if you prefer a lighter dish. After the vegetables have been boiling for about 5 minutes, add your pizzoccheri and lower the heat a bit and continue cooking for another 5-7 minutes. Pizzoccheri take surprisingly long to cook for a fresh pasta—if you taste after about 5 minutes, you may see that although the pasta is already al dente, there is a raw quality to it, due to the particular qualities of buckwheat. Working quickly, repeat until you have used up the ingredients, then pour over all the melted butter (which should be hot). This will partially melt the top layer of cheese. Then toss to mix the ingredients (don’t overdo it) and serve immediately, while the pasta is still hot. There are various theories about the origin of the rather odd name of this pasta. According to some, ‘pizzoccheri‘ comes from the local dialect word piz, meaning a ‘little bit’. Others say it comes from the verb ‘pinzare’ or to pinch, others from the dialect word bizzo, meaning a mouthful. Buckwheat, by the way is called grano saraceno—Saracen grain—in Italian. It was introduced into the Valtellina in the early 1600s, it would seem (judging from the name) having come from the Ottomans, although the historical record is apparently very sparse. These days, local production has practically disappeared and most buckwheat in Italy is imported from China. Russia and the US are also major producers. 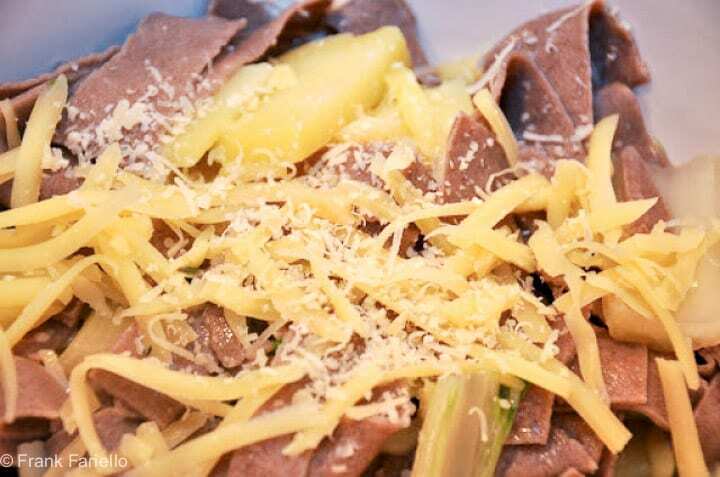 Besides pizzoccheri, buckwheat is used to make another typical dish of the Valtellina called sciatt, a kind of fritter. The Valtellina is these days a popular tourist destination, known for its excellent skiing and other snow sports but also for thermal spas. (I rather like the idea of soaking in a hot spring surrounded by snow-peaked mountains!) 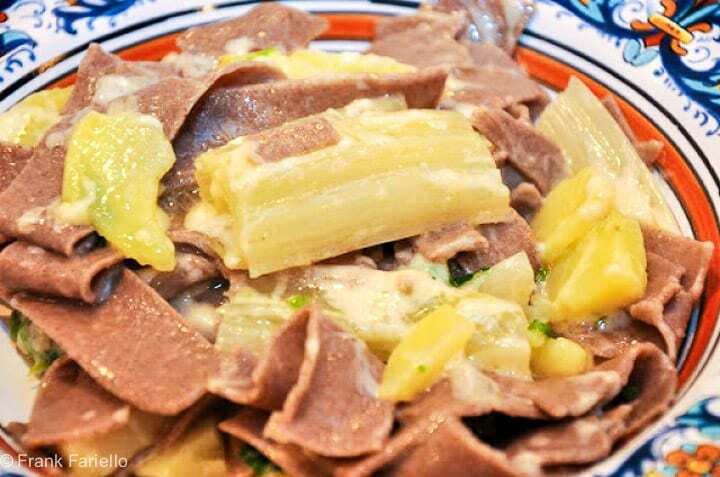 Pizzoccheri are said to come from one of the larger towns in the valley called Teglio, where they have established an academy dedicated to this dish. The Academy has established an ‘official’ recipe, which you can read here, which is a bit different in some details from the recipe given above. In particular, the Accademia recipe calls for cutting the pizzoccheri much thinner (the recipe says 5mm, although I wonder if that isn’t a typo; perhaps 50mm or half a centimeter was meant.) In addition, ‘real’ pizzoccheri are made only with flour and water, no egg. The addition of egg is a common modern heresy, however, as it makes the pasta easier to work with and improves the texture. Some modern recipes also call for a bit of milk, rather than water, to round out the dough. Marcella Hazan, in her Essentials of Italian Cooking, has a recipe for pizzocheri that calls for a short baking period just before serving to warm the pasta and melt the cheese. It’s not a technique that I’ve found from any other source, but not a bad idea. The result is a bit more ‘solid’, if I can use the term, than the traditional method outlined above. Although originally a very local specialty, pizzoccheri have become popular all over Italy, and can be bought in a box like any other pasta, which make them very easy to make. (Here’s a video of them being made in a factory.) I have not found them sold commercially outside Italy, so you’ll have to make your own. Not such a terrible sacrifice, however, as they are actually quite easy to make. But the dough does take a bit of getting used to, as it is not nearly as pliable as normal pasta dough, even with a fair amount of wheat flour. Knead the dough especially well to bring out the maximum amount of gluten. Although I haven’t done so, you might want to experiment with other winter vegetables. Kale, for example, could make for a nice (if unorthodox) change, regular cabbage strikes me as too tough for this dish, but might be work a try. If you use swiss chard stalks, don’t throw out the leaves whatever you do! They can be used like spinach in any number of dishes—among my favorites, in padella (sautéed in olive oil) as a side dish, combined with ricotta as a stuffing for ravioli, crespelle or cannelloni, or as a dressing for pasta. The town of Teglio, where pizzocheri originated. Roll out the pasta rather thicker than other kinds of fresh pasta (I use setting "3" on my KitchenAid pasta roller) and let the rolled pasta sheets dry on a towel. Once dry enough, cut the sheets into strips, as wide as fettuccine or tagliatelle, say about 1 to 1.5cm (1/2 inch) wide and about 5-7 cm (2-3 in) long. Allow these little strips to dry out further while you prepare the rest of the dish (see photo above). While your pizzoccheri are drying, prepare the vegetables that will accompany them, typically potato and a leafy winter vegetable, most often Savoy cabbage. Slice or cube the potato, as you prefer (I like them sliced) and immerse them in cold water. Shred your cabbage and add it, too, to the water. Instead of Savoy cabbage, you can also use spinach, swiss chard leaves or—as I did this time when I couldn't find Savoy cabbage at the market—coste, or the stalks of swiss chard, trimmed of their leaves and cut into lengths about the same size as the pizzoccheri. 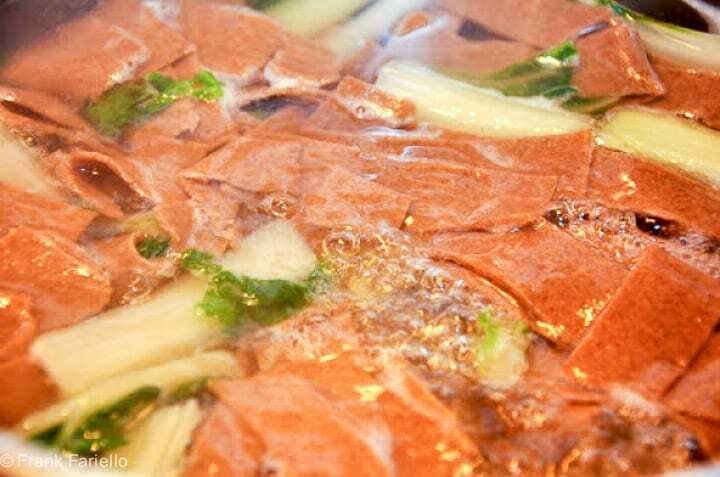 Bring a large pot of water to the boil, salt generously, and add your vegetables. While the vegetables are cooking, melt a nice big piece of butter—at least 50g/2oz. per serving to which you add a clove or two of garlic and a sprig of fresh sage. Allow the garlic and sage to simmer very gently in the melted butter until the butter is infused with their flavors. Do not allow the butter to brown; the garlic should brown, if at all, only slightly. Remove the garlic and sage when you're done. While the butter is simmering, either slice or shred some mild, semi-soft cheese, the most classic choices being the local cheeses bitto or Valtellina Casera. But since these cheeses are hard to find, even in Italy, outside their zone of production, fontina is often substituted. And if you can't find fontina, I'd recommend staying in the Alps and using either Gruyère or Emmenthal. Grate about half that amount of parmesan cheese or grana padano. I like to use a lot of cheese as well, say 50g/2 oz. per serving, although you can use much less if you prefer a lighter dish. Working quickly, repeat until you have used up the ingredients, then pour over all the melted butter (which should be hot). This will partially melt the top layer of cheese. Then toss to mix the ingredients (don't overdo it) and serve immediately, while the pasta is still hot. Wow, I am totally asking my husband if we can move there! What a picturesque town. I always learn so much from your posts! This pasta looks so hearty and delicious, and the town where it originated looks like a beautiful dreamland to me. You have convinced me to give buckwheat pasta a try! This is a simple dish! I hope I can find some of the ingredients in the grocery! I want to try it! Loving this pasta – hearty, earthy – grand for winter – especially with vegetables. This is absolutely my kind of dish. Simple but really flavorful … and oh, yeah – cheese. Thanks for the lovely, informative, and inspiring post. this sounds and looks wonderful! Your homemade pasta and this dish look delicious! I love my pasta maker but have not experimented with adding buckwheat flour–I'd like to try this. I have had trouble with getting my pasta sheets to dry (small kitchen, too much heat and humidity), so I'd probably need to let them rest a bit longer. This is beautiful! I am making this before the winter comes to an end! Lovely and simple dish. I've made buckwheat pasta at home some time, it's a bit more difficult to handle than regular all-wheat pasta.